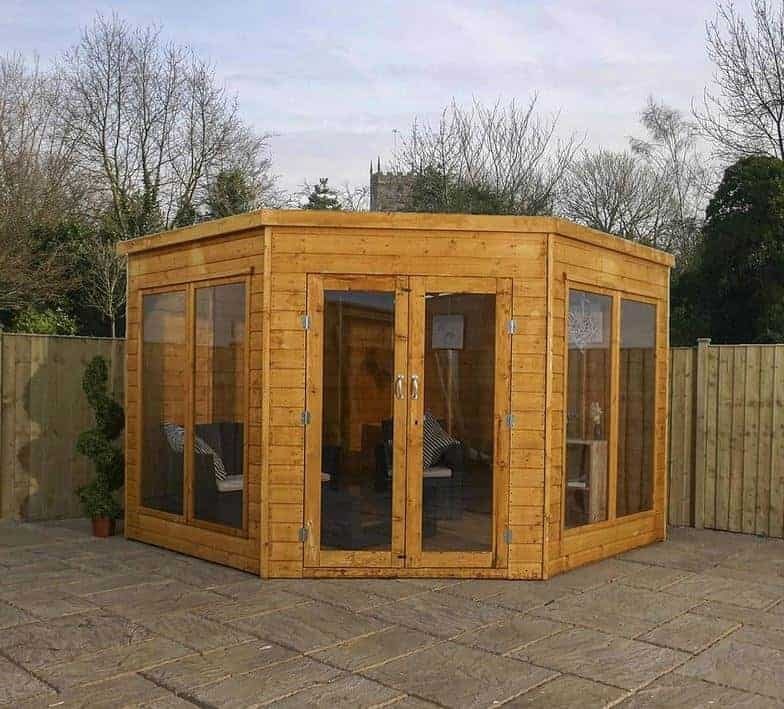 The modern looking and fun 9 x 9 Waltons Premier Corner Summerhouse would be an awesome corner summer house for you to add to your garden. 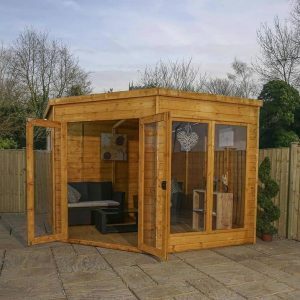 This is one of the more stylish summerhouses on the market and would work very well as a place to relax after work, a fun man cave or even a space where the kids can have their toys and just go wild. The summerhouse has a very smart look with six windows including the ones on the doors. The windows ensure that plenty of natural light is going to get inside. 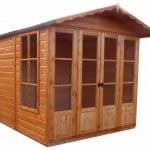 The summerhouse is a very good size and you will be able to fit many items inside here without any trouble. A lot of effort has been put into the design of this summerhouse. 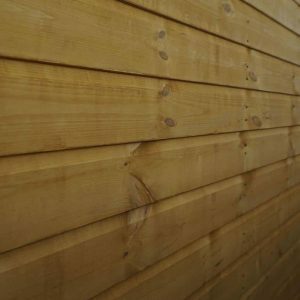 The walls are made with smooth 12 mm thick tongue and groove cladding. The roof is also made with tongue and groove boarding and if that is not enough, the floor is made with it also. The floor is backed up with some very strong floor bearers which allow the floor to take a lot of weight. The whole summerhouse is going to give many years of use and a huge part of this is the robust frame that keeps it all together. Your neighbours are going to be very jealous! 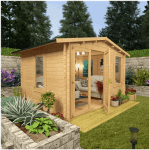 The 9 x 9 Waltons Premier Corner Summerhouse is one truly incredible looking corner summer house. Now we have actually reviewed a smaller and somewhat more modest version of this summerhouse before, but this one here is more of the high roller, high end version. We just love the design and just like its little brother we feel that this one certainly has a pool house kind of look to it. While all summerhouses offer you a place to relax, we feel that this one has more of a fun and party kind of look to it as the design is much more modern than we are used to seeing. It is a very decent size as it is 9 feet 3 inches in its depth and width so you have a lot of room to make use of here. As you can see from the pictures, you can fit many things inside of here and as well as a summerhouse it would work great as a man cave or a kids play room. At the high point the summerhouse is 7 feet high and even at its eaves it is an impressive 6 feet 7 inches. The roof is just awesome. The first thing that catches your eyes is the lovely finish at the front. They have used some very thick wood that really does capture your eye. On the very top we have a pent roof that is made with 10 mm thick tongue and groove boarding. This is very impressive as the smaller version of this summerhouse does not have as high a quality roof as this. The roof is covered by high quality felt so rain is never going to be an issue. On the inside the fact that they have gone with tongue and groove boarding makes it go very well with the rest of the structure. 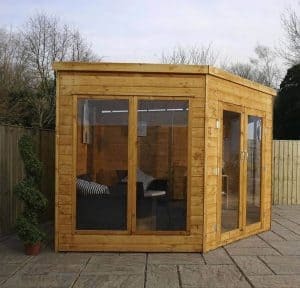 The 9 x 9 Waltons Premier Corner Summerhouse has some of the smoothest looking cladding that we have ever seen. It is a very impressive 12 mm thick which means it is very robust. We love the fact that this cladding is going to never allow rain inside the summerhouse. The cladding really does make a very strong impression and we are sure anyone who comes to your house is going to run their hand over it. This is one very strong and sturdy corner summer house. It has a frame that is 28 mm x 28 mm so the whole structure has a very solid feel to it. We feel that his is the kind of summerhouse that you can easily get 20 or more years out of. A huge reason for this is the frame they have used. So the frame may not be the most important thing to most people, but you will be very thankful 20 years down the line when the summerhouse is just as strong as the day you installed it. The floor is another upgrade from the little brother of this summerhouse. They have used 12 mm thick tongue and groove boarding and as you can see from the pictures. The fact that the walls, roof and floor are tongue and groove make the inside look very smart indeed. Under the floorboards they have 28 mm floor bearers which give it that little bit added strength which is great if you plan on putting heavier items inside the summerhouse. The 9 x 9 Waltons Premier Corner Summerhouse will be safe during transit and installation from the elements as it will be given a base coat treatment. This is only good for a few weeks at most and you will want to give it a coating of wood treatment shortly after installation. Once a year you will have to get the wood treatment back out the shed to give it a fresh coat. This is not that much work at all and something most other summerhouses require you to do. Waltons offer one of the best warranties out there. This corner summer house will come to you with a ten year anti rot guarantee. 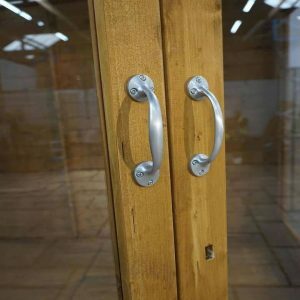 This is dependent on you treating the wood on a regular basis, so if you do not treat it then three years down the line rot appears, you will not be covered. Right in the centre of the summerhouse is a set of double doors. These doors are mainly made with styrene, but they have some very nice thick framing that we really like. We actually think the decision to mainly use styrene for the doors was a very good one. With both doors open, you are going to have no problems getting something as large as a sofa in here. at 3 feet 11 inches wide and 5 feet 9 inches high, the doors make getting in and out no trouble. Actually these doors offer so much space you could even strut your way inside! Another upgrade this version has over its smaller brother is that it has extra windows. There are two large windows on each side that are separated by a small frame. We really like this design and it is certainly going to ensure that a lot of natural light gets inside. These windows along with the ones that are on the doors really do look very smart. All of the windows including the doors are made with 2.5 mm thick styrene so that are going to be fine if one of the kids thinks they are Ronaldo and kicks a ball at them. As all of the windows are fixed and there is an included press lock, the 9 x 9 Waltons Premier Corner Summerhouse is actually quite a secure summerhouse. You may want to add a padlock or something like that though if you plan on keeping a few more expensive items inside. This is a corner summer house that has a design we really love. Part of the modern design is the generous amount of large windows. Of course this does mean that while it looks good, the summerhouse does not offer much privacy at all, so you may want to consider adding some blinds, curtains or just some fabric. Waltons do not give any customisation options with this summerhouse, but to be honest customisation is not something we usually associate with Waltons anyway. But if you do want to jazz this up a little bit, then you can get some pretty wild coloured wood treatments these days. Of course if you like things a bit more straight, then they do have more traditional coloured wood treatments as well. 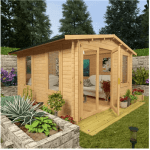 The 9 x 9 Waltons Premier Corner Summerhouse does have a few extras you may be interested in. We feel that the roof is great as it is, but for £39.95 you can upgrade the felt to superior roofing felt. This can be in either charcoal or green. 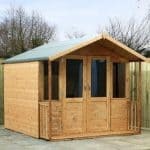 If you are a little concerned about the surface you are installing this corner summer house on then you may be interested to know that there is a Waltons pro shed base. This is great, but it is a very expensive extra at £234.99. There is also an installation service, but we do feel that £224.95 is a little expensive. This is just an incredibly well designed summerhouse. The people behind this really have created one incredible looking and well made summerhouse. You are going to easily get 20 years of fun with this. The tongue and groove cladding used for the walls and the floor and roof are very long lasting. Add to this the frame and you have a summerhouse that is built to last. Just remember that keeping it rot free is your responsibility. 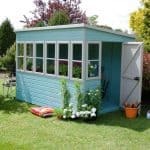 9 X 9 is a great size for those of you who want a good amount of room, but do not want a summerhouse taking over the whole garden. As long as the person you have helping knows the difference between a hammer and a screwdriver, you should have this installed in 6 hours at the most. Best of all, it is so straightforward there should be no trips to A&E! We feel that with the materials used and the design, Waltons are asking a very fair price for this summerhouse. 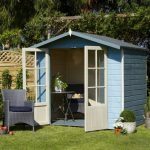 Final Thoughts: The 9 x 9 Waltons Premier Corner Summerhouse is just such a smart looking corner summer house that it is impossible not to be impressed. They really have done a remarkable job with this and we are sure that anyone who has this is going to just love it. While it is very easy to focus on how attractive this summerhouse is, we must also tell you that it is very well made. 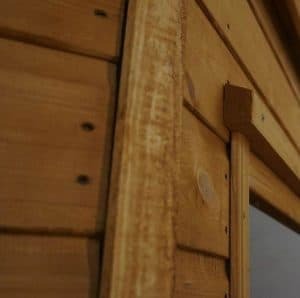 A strong frame, tongue and groove cladding along with tongue and groove boarding make this one very smartly designed summerhouse. We honestly have a hard time coming up with anything negative to say about this summerhouse, that is how much it impressed us!